While watching From Russia With Love (1963) recently, I was amazed to see something in the movie I had long forgotten—the James Bond Gold Piece! Near the beginning of the movie, Q delivers a special black brief case to Bond. The case was filled with the usual rounds of ammunition & many high-tech weapons – but also featured two straps hidden inside the lining of the case, which secretly held 50 Gold Sovereign coins! While this may just seem like another exciting moment in a classic action film, I can tell you that Gold Sovereigns haven’t just saved the life of movie spies – they have saved the lives of countless British servicemen & real espionage agents for nearly 75 years! During World War II, Gold Sovereigns were included in the survival kit of all special operations agents – which is what inspired Ian Fleming to write them into his James Bond novels! In more recent times, British Gulf War service personnel at risk of being stranded behind enemy lines were issued with twenty sovereigns per person to buy emergency food, shelter and safe conduct. The reason is simple: The Gold Sovereign is one of the most recognized & respected gold coins in the entire world! A gold sovereign contains almost a 1/4 oz. of the finest quality, 22-karat (.9167 fine) gold. Back in the days when all British paper money was backed by gold, a gold sovereign equaled one British Pound. That doesn’t seem like much today, but back in 1817 when the first sovereigns of the modern era were produced, a British Pound was indeed a substantial amount of money. In fact, paper money wasn’t widely used until the middle of the 19th century, and it caught on very slowly in remote areas of the globe where there were no banks. In these places far from England, the British gold sovereign was recognized as a solid standard of value—no questions asked. Because of this recognition, almost anything could be purchased with sovereigns—they were the coins that built the British Empire! 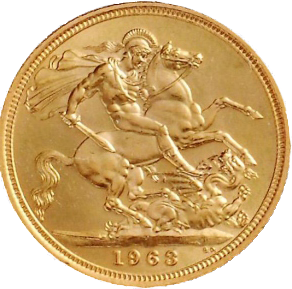 By the time Queen Victoria died, the British gold sovereign had become one of the most popular gold coins in the world. 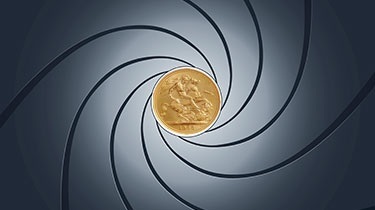 Eventually, the Royal Mint in London authorized Mints in Australia, South Africa, India and Canada to strike gold sovereigns in order to help keep up with world-wide demand. These days, all British Gold Sovereigns are struck by the British Royal Mint at their highly-guarded minting facility in Wales. You can add a few Gold Sovereigns to your collection by shopping at GovMint! About Steve Wolff - Steve Wolff has been involved with collectibles and coins for over 30 years. During that time, Steve has served as a fine art gallery director, president of a nationwide collectible coin company, director of coin product development, liaison with world mints, and his present role as Creative Director for GovMint.com and its affiliated companies.